Marriage Proposal is a highly anticipated event in every pair’s life – especially for the girl. And the importance of official, well-planned and highly emotional proposal is sky-high. India is one of these unique countries where the past and the present are perfectly entwined together. Plus, despite the vast influence of the Western World traditions of India are still in place and it is always expected of the potential groom to express his interest in marrying the particular girl in both spiritual and material way. Although it may seem that the admiration of diamonds is a result of Western culture and marketing hoax – the truth is that many Eastern cultures had treasured the notion of possessing a piece of nature which required thousands of years to create. Hence, proposing with an engagement diamond ring is certainly a must in order to evaluate the earnestness of the mans’ intentions. Plus, the ability to afford such jewel speaks volumes on the ability of the man to support the family he’s about to start with the bride to be. The importance of the diamond gold ring is also in establishing the social status of the groom, especially when the bride is coming from a good, well-known and established family, which imposes certain expectations from the future husband. One of the most notable Indian influences on the world is the movies, known as Bollywood, which clearly reflects the high artistic and cultural value. It also means that these movies set certain state of mind on the subject of marriage proposals in this country. The Bollywood vibe is very romantic, musical, colorful and full of joyful luxury. Hence, the proposal inspired by this cultural tendency is expected to show the same characteristics. In other words – presenting the proposal with a beautiful diamond ring and getting down on one knee is expected, but in order to rightfully anticipate a “YES” one must go the extra mile. This may include taking extra measures in the scenery, such as proposing in a beautiful hotel room or in a beautiful location in the nature. In order to receive the desired answer when popping the question in India, it is crucial to pay attention to the tiniest of the details, including the quality of the diamonds, the design of the gold ring and the small details that will make it totally irresistible. This includes the usage of different (but equally valuable) materials, engraving messages such the initials or eternity symbol in the inner side and more. The diamond engagement ring is more than a jewelry, it’s the first chapter of the new life together and it has to be well written. 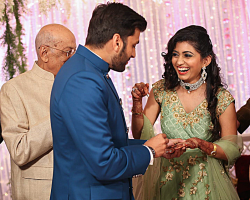 Marriage proposing in India is a form of art and it has to be performed accordingly.